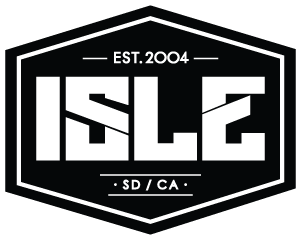 The ISLE SUP Day Bag is fantastic for protecting and transporting your stand up paddle board. The bag is constructed with extremely durable and heat resistant polyester fabric. The bottom of the bag has a white heat reflective tarpaulin material and air vents to prevent heat damage. The entire bag has 5 mm of protective padding and reinforced nose/tail that gives extra protection at the most ding-susceptible areas. The non-slip shoulder strap works perfect for hands free transporting and is removable during travel. The bag’s two padded comfort grip handles will help with loading and unloading the board. Also included is a Velcro fin slot so you have the option to keep your fin on during transportation. The heavy-duty corrosion resistant zippers provide full access to your board. Check out our Day Bag video! The ISLE 15L Dry Bag is a rugged all-weather gear protection that will keep your items safe and dry from anything mother nature throws your way. The bright color comes in handy in the event that your bag is lost or falls overboard. This is the perfect size to pack what you need for the day and isn’t too big or bulky where it’s difficult to strap to your board. With a removable shoulder-strap you can sling it over your shoulder or strap it to your boat or stand up paddle board. We suggest leaving a little air in the bag so it’ll float in the water if it falls off the board. This dry bag is made with a heavy duty 500D fabric, vinyl-coated for watertight protection. Check out our Dry Bag video! My pump gauge isn't registering...now what?